Today there is widespread awareness of the fact that time has been under-investigated in organizational studies. This book addresses the need to bridge the gap between the predominantly "timeless" theories and models that scholars have produced and the daily experiences of employees and managers, in which time is salient and extremely important. These chapters offer a broad range of concepts, models, and methods that are tailored to this purpose. 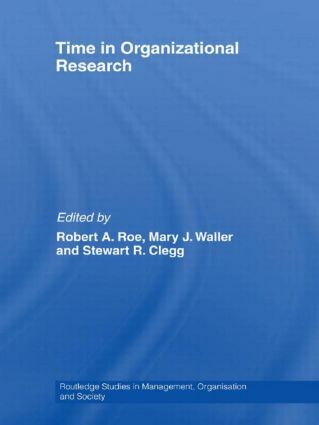 The first part of the book is devoted to the way in which people in organizations manage time, summarizing research findings, presenting novel ideas on a broad range of issues and examining issues such as whether time can be managed, how people are affected by deadlines and how do strategic changes in organizations affect individuals’ careers and sense of identity. The second part is about time as embedded in collective behaviours and experiences, and in temporal regimes linked to organizational structures. It discusses ways to study such collective patterns and their relationships to management practices, and addresses topics such as sensemaking of dynamic events, rhythmic patterns and their impact on organizational effectiveness, time in industrial relations, and power and temporal hegemony. A third part with a single concluding chapter looks at possibilities for integrating the various approaches and provides suggestions for future research. This book adopts a pluralistic approach, arguing against timeless conceptions in organizational theory and behaviour and instead emphasising the importance of temporal analysis.